This tutorial caters for every level of people who are interested in the art of wire jewelry making. The painstakingly made tutorial contains so much detail that any level of enthusiast is able to make the piece. Another Chinese Knots has been successfully integrated with Wire Jewelry making this time.For those who are interested in how Chinese Knot can be integrated with Wire Jewelry making should purchase this guide. The beautifully taken 115 pictures (including the two coverpages) will provide you the means from end to end to make this precious piece, regardless which level you are at making wire jewelries. In this document, it also listed out the tools and materials being used. Thanks to our dear fellowship that contributed in knowledge sharing of Chinese Knots out there. 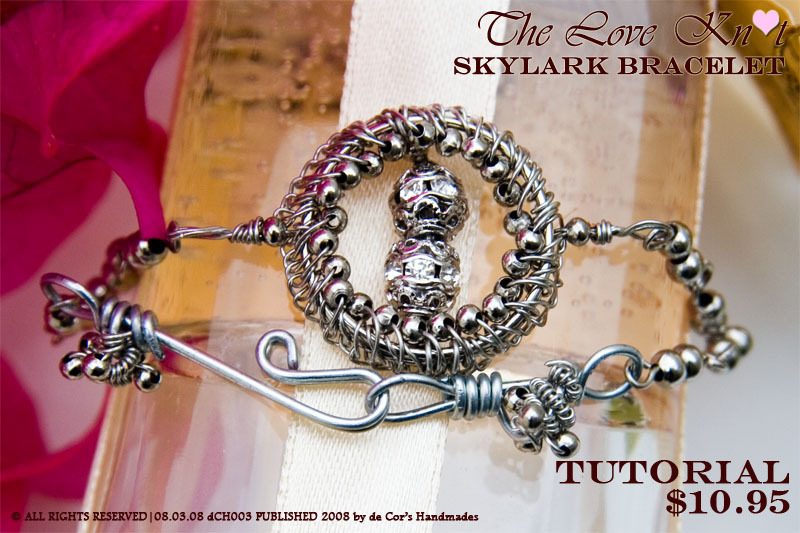 You can also pay for the tutorial via PayPal by sending 10.95USD to decors.l@gmail.com by specifying "DCH003 Skylark Bracelet" in the title of the transaction, or click on the below "Add to Cart" button to purchase. The PDF format file will be sent to your E-mail address specified in your Paypal account.